After the long days of summer, winter months bring a calm and peace. To us, there is nothing better than cozying up by the fire after a long day playing in the snow. Our heavy-weight textured paper gives this collection a burlap fabric look and feel, highlighting the sophisticated and vintage-style designs we are best known for. The neutral color-tones deliver a soft, yet useable palette which set this collection apart from most winter-themes available. 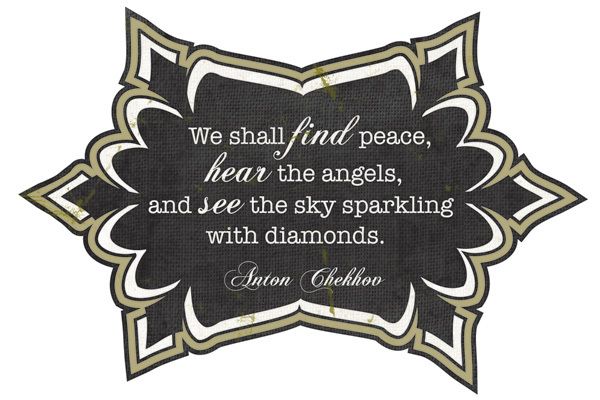 To see images of the Peaceful collection, please visit the products section of our website. We want to GIVE AWAY a "Peaceful" prize to one lucky fan! Just leave a comment telling us what you love about this collection and we will draw announce a winner later this week! Well you picked the perfect name for this line! I love the soft neutral colors and patterns. You can use this for so many different occasions, and mix and match it with everything. LOVE! I love this collection, it is as it is named truly peaceful! It will work so well with the snowy scenes of winter but also for sepia or black and white photos,they will look stunning on this background! I love the muted colors and designs. It's beautiful. Wow, this is such a gorgeous, elegant collection! The muted colours make it a very versatile one. 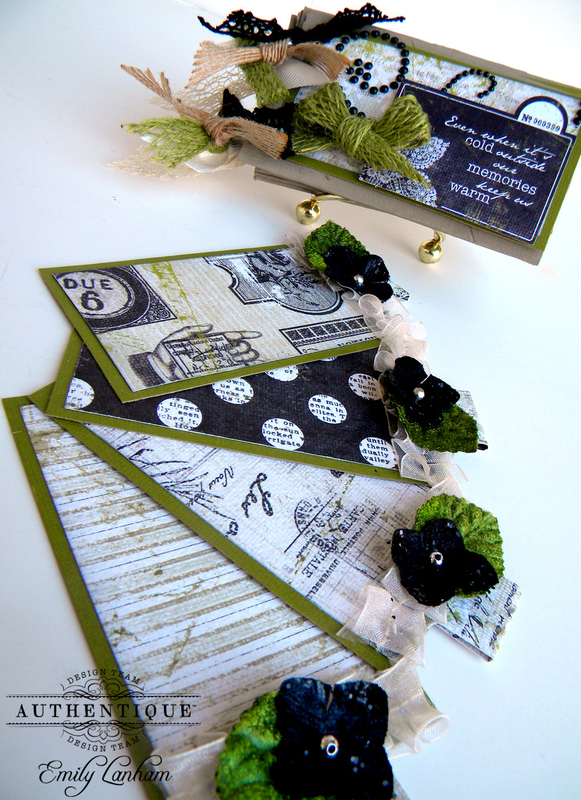 love the colour in shades of black and grey which is perfect for making vintage/wedding photos layout. I love the neutral colours in this collection! Gorgeous!! Seriously gorgeous collection! I am such a fan of the black and white look and love how it'll be a great mixer with many of your other collections. I love how the colors are muted, and blend together so well. I love the muted colors and patterns! They are so beautiful and elegant. Very sophisticated!!! Beautiful papers. While doing my vintage collages, I'm often looking for a very subtle background, your new line is beautiful! Thank you for sharing! Such an elegant and restful collection! It will go beautifully with the winter pictures, and any black and white pics. Truly timeless collection. I feel like I'm taken back in time. This collection is just lovely. What a fabulous neutral pallet. I love the polka dots the best. What a sweet collection! The soft neutral colors are perfect to match up with any color, bold or not. I love the vintage images on the Freeze paper and the birds and the Details stickers! I love it all :) Of course, I love all of your collections! I love the neutrality of this collection! Lend itself well with just about any time of year or occasion. Thanks for the chance to win!! Love the interplay between the neutrals and the green. A wonderful collection and will be very usable. I love the versatility of using the papers. I love the time-worn vintage look of this collection! I already can see so many projects to make using it. Thank you for the chance to win. I love the versatility of the neutral colors. They can be used to create a project just together or mix well with other palettes. BTW, that teacup is to die for! this line is gorgeous beautiful work! The neutral palette is appealing to me. You can yes a color to give it a pick me up. Or keep it simple with a black and white photo. Peaceful is a very appropriate name. The neutral tones make it easy to add just about any colour to and I love the theming - the old fashioned skaters are so fun. The bird paper is elegant and I always enjoy your word sticker sheets and alphas. I really like the lovely designs on the great muted colors of the papers! What a great collection! "Peaceful" is the perfect name. I love the tonal colors and textures...and it can be used in so many different ways. Thanks for the chance to win such a nice design. I love the sophisticated and elegant look, and how it is much more than a Christmas line. This is incredibly versatile. This is beautiful! I love the patterns and the softness of this collection! It is a perfect name for this collection! I love black and white...black and cream....and the patterns are fabulous. There are so many ways to use these papers! I love the colors...so fabulous!! I love the classic Black and White color scheme, so timeless! I love the soft neutral colors. Very nice projects! What a great collection! I especially love how it complements the green in the examples. I would love to play around with Peaceful! Beautiful collection! I love the soft neutral colours! what a great collection. loves the project what has been made with this paper. i know we want this paper a soon it's in the netherlands. I love the colors and the soft vintage-y feel. There is so much I can see myself creating with these papers. Gorgeously understated! I have so many photos that would work perfectly with this line.....thanks for a chance to win! Love the subtlety of the colors - I see uses for this collection way beyond winter/Christmas. Lotsa shabby chic opportunities with this one. I love the versatility of the muted and neutral colors. It would be easy to use any color to complement your project. Such a beautiful paper colection! Love the neutral colours of this line! Simply beautiful!! This collection has the vintage feel to it that will allow you to almost do anything with it. There will be no headaches trying to put color photographs on this line...it just looks like it might be the perfect collection. Authentique choses the most wonderful patterns and colors for their papers. So versatile. An absolutely gorgeous collection! I can see endless possibilities here. THis will really allow the picture, embellie, or single color to pop. I love everything about this collection, the soft muted colors the beautiful patterns. This collection would work with so many projects. Thank you for a chance to win. Neutrals and those large lacy flowers that look like snowflakes...perfect for Minnesota! My favorite thing about this collection is the NAME!! It fits perfectly! The soft, subtle, intricate, and aged patterns/textures/colors are just that...PEACEFUL!! So versatile & easy to use!! This collection is just beautiful! What i love most about it is that you can match it with ANY of your favorite colors! The possibilities are endless! Thank you so much for the chance to win! Such a pretty line, I love the monochromatic look and the delicate patterns. Oh I hope I am the lucky one to get this in their hands! I love the muted colours with the touch of evergreen colour! I love the colors. Green is my favorite, and I love how it is played in with the darker colors. Looks great! as expected another beautiful line of paper! The colors are gorgeous! I love neutrals! Great line, definitely is peaceful! Love the elegance and feel of this line! Love these colors....black and white always looks elegant. Great designs! Peaceful is a great collection, the color tones are perfect for the winter months. However, it is so elegant you could use it for other occasions as well...really like it. Wow! Those papers are so beautiful! I would so love to win this collection! Thank you so much for the chance! I love the colors, they are perfect for vintage style projects. There is just something about the black and white that screams elegance. Love it!! First I just think it’s beautiful! But I really like how it’s not the typical winter line, its neutral and elegant I just love it! It's so gorgeous, with such personality!!! I can only image the project you could create with this collection. It has the perfect name. It is beautiful for sure. Oh how I love Authentique papers! This collection is absolutely amazing. Keep them coming! This is such a great kit! Thanks for the opportunity to try it out! Love it, they have a tranquil old-world feel to them, marvelous really! another hit for sure. I want to try it with happiness from the blissful collection. It took forever for me to find that paper in stock. I'm on the hunt again for this one. 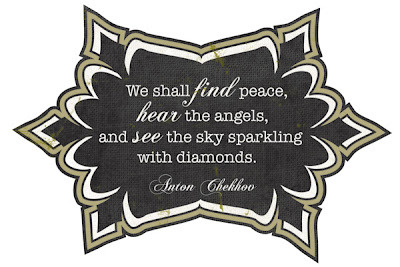 I love the beautiful papers in the Peaceful pack - They really do evoke the feeling of peacefulness. Thank you for the opportunity to win some also. I LOVE the black and white... its so versatile!!! And the patterns are GORGEOUS!!! soft colors yet eye catching...love that it makes a "GROWNUP" classy holidays/seasons statement! Oh, this is fabulous and totally up my alley these days. My new favorite color has been gray!!! So, this is awesome. I love the look it has with the pearls and the idea of the black and white Christmas tree layout. Fab! That is my favorite winter collection this year!! Love the gender neutral colors, great patterns that remind me of cozy sweaters of most of all the images of skates and ice skaters. Being a mom to an ice skater I am always on the hunt for those! I love the versatility of the colors and designs, i can use them not only for winter projects but all year long, masculine cards, etc. I absolutely agree that the neutral tones in this collection are perfect for winter and that chilly feel. You are the only line I've seen that brings this out. Thanks for sharing. I've gotta go with everyone else.. the neutral colors and softness. Sometimes you just want to get away from the greens and reds. Oh WOW! Think this is my favorite this year. I love the neutrals and elegance of the papers. So wonderful for winter and not the traditional blues, reds, and greens. Love it and would love to win it. THanks for the chance. Love the colours; the beautiful green! Beautiful! this collection as it is neautral so it can coordinatate with several other colors; can be made to be vintage (which I love) or made to look a little more modern...just depends on how you embelish it and what colors you mix with it. This can be used for several beautiful home decor projects. Thank you for the chance to win! I love the softness and subtle tones of the collection. I am a huge Authentique fan and this paper collection is yet another great reason. Perfect for so many things. Love the colors, patterns, textures, well just all of it! This line is beautiful!! It is perfect for the many photos of the holidays I have when I was growing up! It has a great vintage feel to it.....the patterns are fabulous (as always!). how beautiful is this new line! 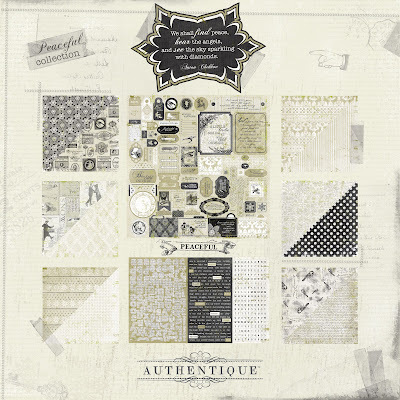 love the vintage feel and neutral colors.Perfect name as well can't wait to scrap with it! Can't go wrong with black & white, but combined with the appealing texture of your paper this will be a collection I will work through quickly! ohhhh stunning line, LOVE the softness and classic, vintage feel of it!!!! I love the color and the designs. I love how well they accent each other. I am usually not a fan of white but I absolutely love this! "Peaceful" is the perfect name for this collection because that's exactly the feeling you get when you see it! Absolutely beautiful! I just love this type of paper-especially with black and white pictures! So classy! And Peaceful is an excellant name for the paper-calming, brings back those "yesterday" memories we all have and love! Keep up the great work! Wow...this is some beautiful paper...like an add-your-own-color collection! Imagine the possibilities! This collection is amazing! I love that I can use it for anything and add color! Beautiful and elegant collection. Thank you for the chance to win it. This collection is so beautiful! Peaceful is truly and apt description for it! Yes this collection is peaceful and very warm, I just love the colors and to add a bright and vibrate color to it can just go in all different ways. Thanks for sharing, God bless you and yours. Love the muted sophistication of this winter line. Right away I started picturing these pretty papers featured on my Christmas cards and tags. Love all your lines they are very much my style. I would love to know how Jess Kinderstampo made the tea cup and what she used. It would make wonderful get well and thinking of you gifts! At first glance this paper almost looks too peaceful and then! it screams for you to create with it. I plan on using it to make cards, be a part of my scrapbooking and craft something special. Love the teacup! Love all your lines of paper, BUT this line is so beautiful...it's soft and yes, peaceful! Love the paper that has soft snowflakes....and that tea cup is just beautifully done! I think this one of the most beautifull line ever! love the color combo , soft and silent.So we can make totally different kind of christmas cards! thank you!